For pedals with higher voltage requirements, the Voltage Doubler cable will combine two 9V or 12V Pedal Power outputs to create a single 18V or 24V output. This adapter features two BLACK 2.1mm barrel plugs to a single BLACK 2.1mm barrel plug for use with any standard center-negative pedal. Ideal for MXR Flanger and Dime Distortion, Crybaby 535Q, and various Fulltone and Keeley products. For pedals with higher voltage requirements, the Voltage Doubler cable will combine two 9V or 12V Pedal Power outputs to create a single 18V or 24V output. 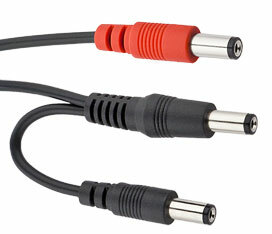 This adapter features two BLACK 2.1mm barrel plugs to a single RED 2.1mm plug for use with center-negative polarity pedals. Ideal for Electro-Harmonix Deluxe Memory Man, Stereo Memory Man, Electric Mistress and others that require 24V. 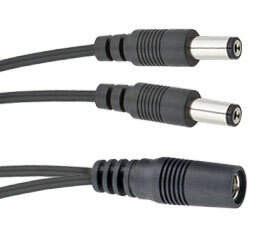 Flanger Hoax requires this cable but only requires 18V. For a voltage doubler with a 2.1mm barrel connector and standard (center-negative) polarity, see cable part # PPY. For pedals with higher voltage requirements, the Voltage Doubler Adapter will combine two 9V or 12V Pedal Power outputs to create a single 18V or 24V output. This adapter features two BLACK 2.1mm barrel plugs to a single BLACK 2.1mm jack for use with any standard power cable with a 2.1mm plug. Ideal for MXR Flanger and Dime Distortion, Crybaby 535Q, and various Fulltone and Keeley products.